Our buddy Matt Kaplowitz (a.k.a., "The Fight Nerd") is showing his documentary "Girl Fight: A Muay Thai Story" at the Rahway International Film Festival on Sunday at 1pm. For a fighter, winning and losing is everything. For the women of “The Girl Fight Gym” in Toms River, New Jersey, winning means more than having your arm raised after a match. 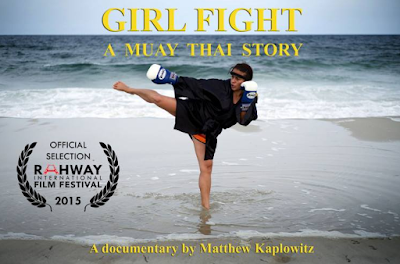 Prairie Rugilo recognized that fact and opened her all-female Muay Thai kickboxing gym in 2009, and since then has been inspiring and empowering women through the martial arts. Along with her training partner, Jaime Philips, Prairie coaches a fight team of people that may not have ever stepped into the ring unless they were at this gym. One of those students, DeAna Mendez, plans on making her amateur debut, while Prairie prepares for a shot at a championship belt that she once held and believes she was robbed of in a controversial fight. Prairie and DeAna must overcome their personal demons through the support of their teammates and loved ones to become the champions they want to be, embarking on a journey that takes them down roads they did not expect to go through. With the backdrop of the recovering Jersey Shore in the wake of Hurricane Sandy, these two fighters battle in and out of the ring against their greatest opponent – themselves. Obviously, since this flick deals with the local fight scene, it's relevant to my interests. But Matt is a pretty cool dude as well, so factor that in your decision to check it out.